Next time I’ll sear the fillets longer before sticking the pan in the oven. Otherwise things turned out okay. 29 Oct	This entry was published on October 29, 2008 at 12:01 am. 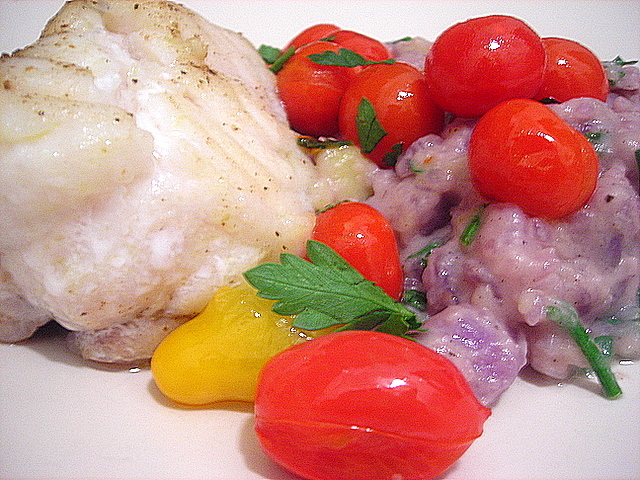 It’s filed under food, general and tagged cooking, dinner, monkfish, potatoes, tomatoes. Bookmark the permalink. Follow any comments here with the RSS feed for this post. I have mixed feelings about monkfish, as it is endangered. Once in awhile I buy the fillets, but I have resigned myself to never tasting the liver. I got a bag of blue potatoes from my CSA and put them on top of the fridge and they were rotted by the time I went to use them three days later. I was crushed.